Eighty degrees and sunshine — that’s how our family prefers to do “ski week”! 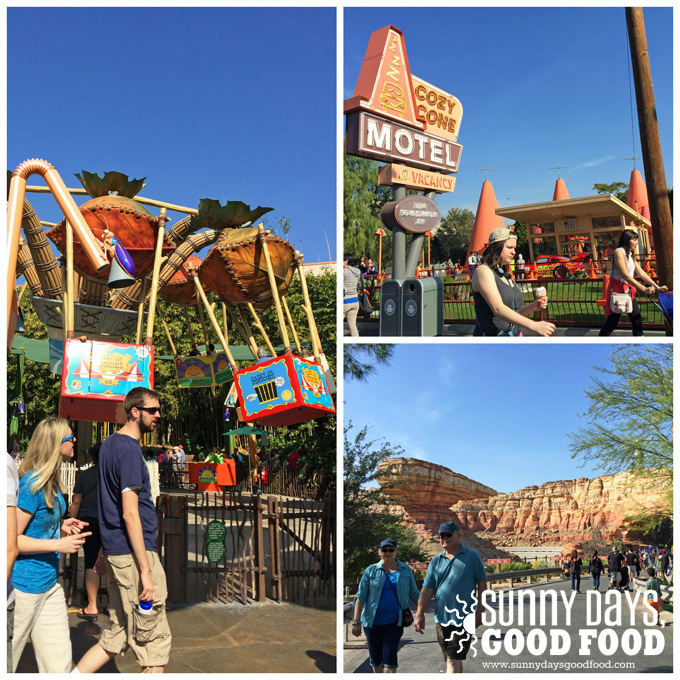 We popped down to the Disneyland resort last week and I thought I’d share with you how that all went. 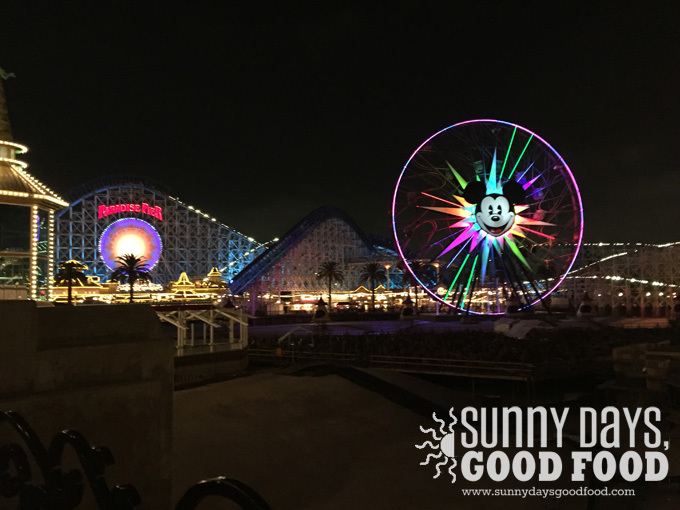 I’ll split it up into two parts: I’ll devote this post to California Adventure (aka, the one with the wine) and next I’ll share our highlights from Disneyland. 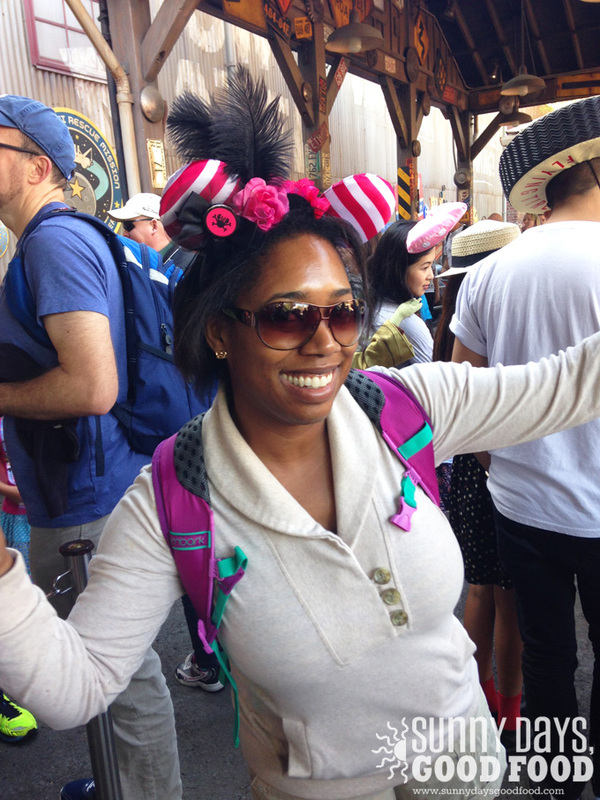 One day my rocking the mouse ears will embarrass my children, but fortunately we’re not at that point yet. Game on! We actually went to California Adventure on the second day of our trip, but I’m sharing it first in case some of you aren’t as familiar with that park. It’s directly across the entry plaza from Disneyland and, especially fitting for this blog, celebrates the splendor of our state. 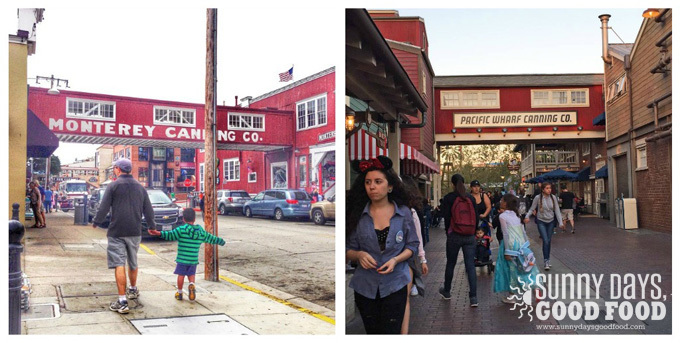 Here’s a cool example in the pics above — I took the one on the left of Mike and our little guy last summer on Cannery Row in Monterey, on the right is California Adventure’s rendition of the same scene. Pretty close! 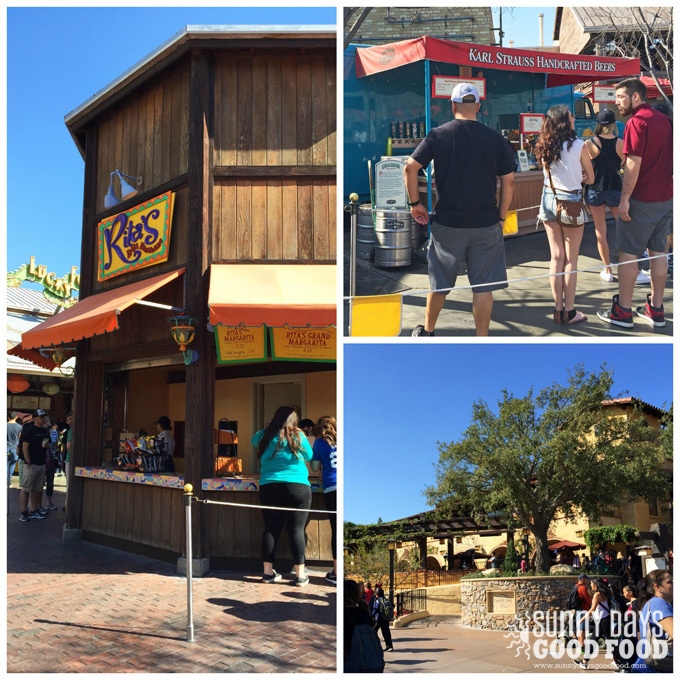 True to Disney, they keep their alcohol choices on the California theme — you can get a margarita at Rita’s Baja Blenders, there’s a Karl Strauss truck (hey, San Diego) and, of course, California wines. I’m one of those people who can’t drink on a warm afternoon without getting super sleepy, so I held out until dinner for my much-appreciated glass of chardonnay. 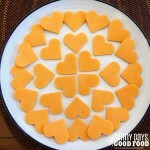 Let’s turn our attention to some food. 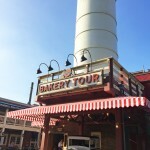 We hit Boudin Bakery’s Pacific Wharf Café for breakfast (I didn’t realize that Boudin only has locations in California — my son and I have lunch dates at the one near us once or twice a month). They offer a bakery “tour” which is really more of a low-key exhibit on how they bake their bread (the kids enjoyed watching the bakers through the window). 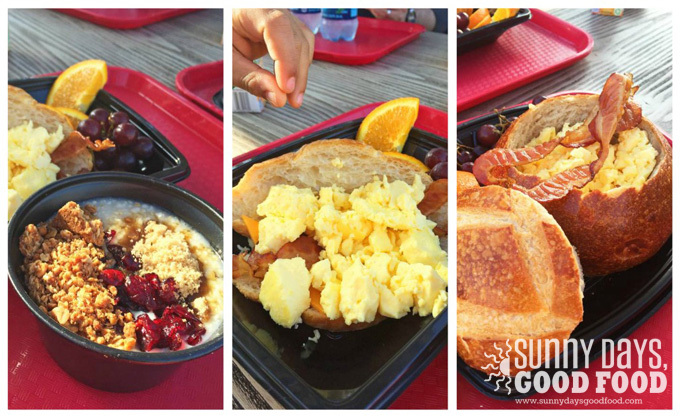 Pacific Wharf Café offered three breakfast items (besides their regular pastries), so we picked up one of each: (left to right) oatmeal with granola, dried cranberries and brown sugar; the Breakfast Croissant Sandwich with scrambled eggs, bacon and cheddar (5-year old pinching hand hovering above was a freebie); and the Egg and Bacon Boule. 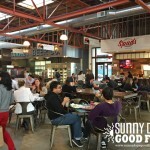 I’m a fan of Boudin’s bread…the eggs, I’m afraid, while fluffy were kind of devoid of flavor. The sandwich would have been a lot better if the cheese had been melted. The oatmeal was our favorite of the three and, arguably, probably the best choice for a full day of walking anyway. It’s also only $4 — one of the better deals at the parks! By the way, yes, of course we went on a ton of rides and did whole lot of fun stuff other than eat! The Radiator Springs Racers ride is our prevailing family favorite (you have to FASTPASS that one immediately when you get there — they run out and the standby wait is often 2 hours!). 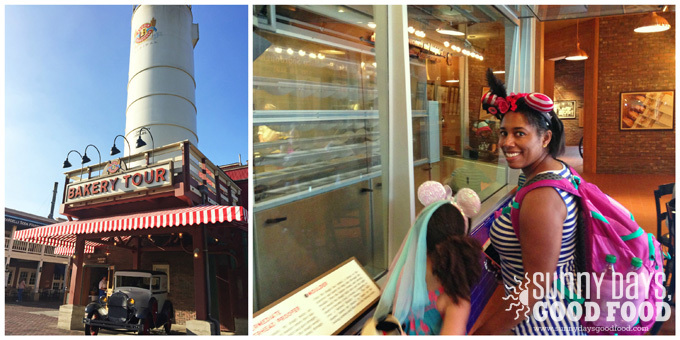 But I called this post “The Delicious Side of Disneyland”, so the food is what we’re gonna focus on here. So…lunch! We picked the Mexican place, Cocina Cucamonga, which was decent. 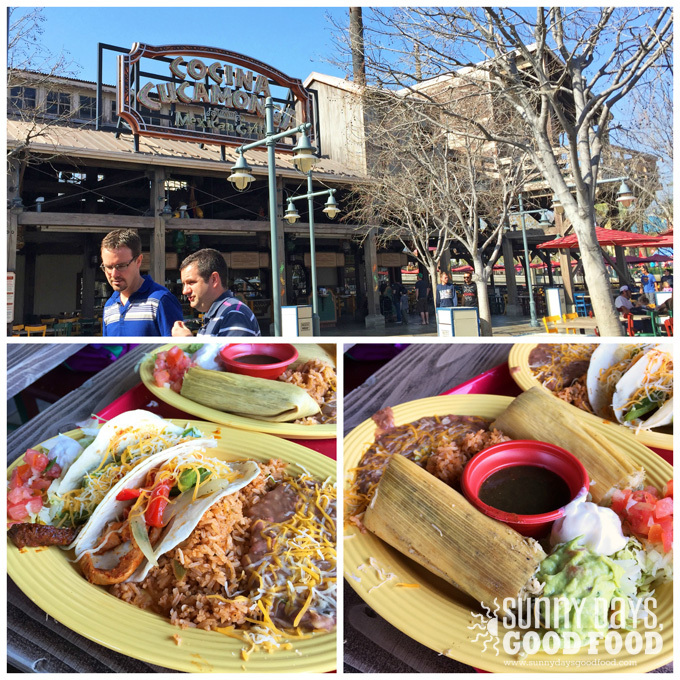 I actually really liked what we ordered — Mike and I had the Soft Tacos Monterrey (left) and the Chicken Tamales (right). I have to say that, on the whole, the food at the Disneyland parks is a bit better than most amusement parks I’ve been to. But it’s still park food so, you know, adjust your expectations somewhat. I take it back, I guess we did experience a little “snow” during ski week. 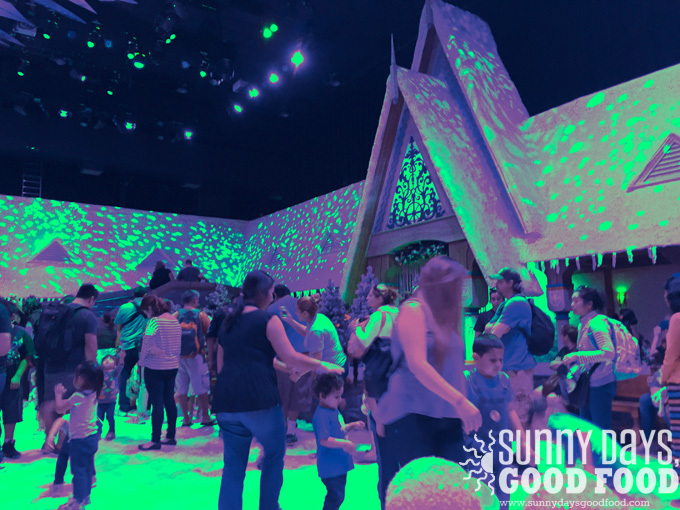 🙂 Olaf’s Snow Fest is now open, by the way, if you haven’t been to California Adventure in a while. It’s one of the few attractions that has a long wait (we did 40 minutes) and no FASTPASS option, which usually would mean we’d skip it, but the kids really wanted to try it. One loved packing snowballs, one exited the play area immediately due to a dislike of how the ice felt on his hands. A Frozen margarita would have been appreciated by me at that moment! I settled instead for a frozen ice cream bar. 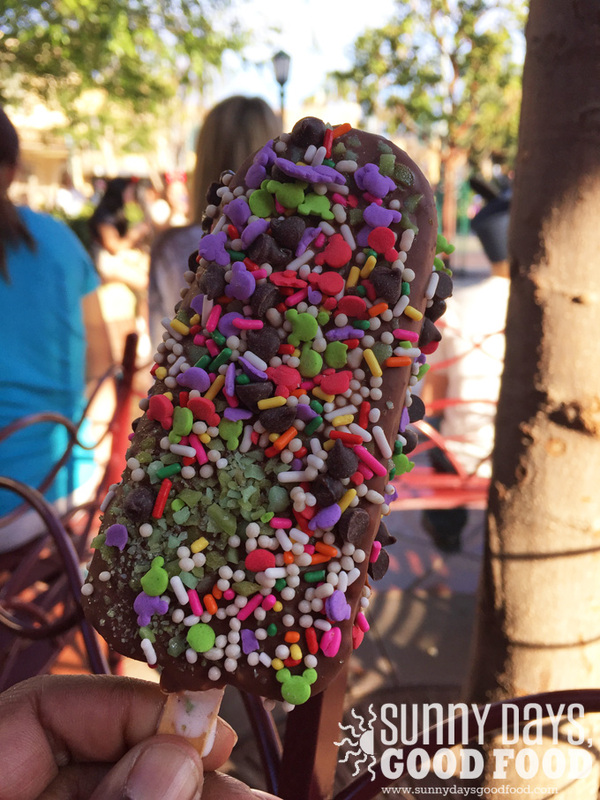 🙂 At Clarabelle’s you can get hand-dipped bars such as this one. On the menu board, they showed pictures of a bar with a few types of sprinkles and a bar with lots of sprinkles…so, naturally, my son and I went with the works. Well…some of those “sprinkles” turned out to actually be pop rocks! 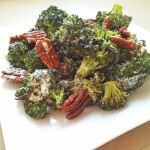 Totally wasn’t expecting that — I took a bite and suddenly things were kind of effervescent in my mouth. I looked over at my little guy — who has never had pop rocks before — he had an interesting look on his face! As the sun went down, temperatures started to dip (I won’t say to what — New Englanders, you would have broken out the swimsuits) and I was especially glad I’d made a dinner reservation at Wine Country Trattoria. Big tip: once you’ve decided to visit the Disney parks, go through the website and make meal reservations. We’ve learned from past visits that after a long day of walking and rides, we just want a place to sit down and enjoy a decent dinner — preferably inside, if it’s chilly out. It seriously is no time of day to be waiting in yet another line! 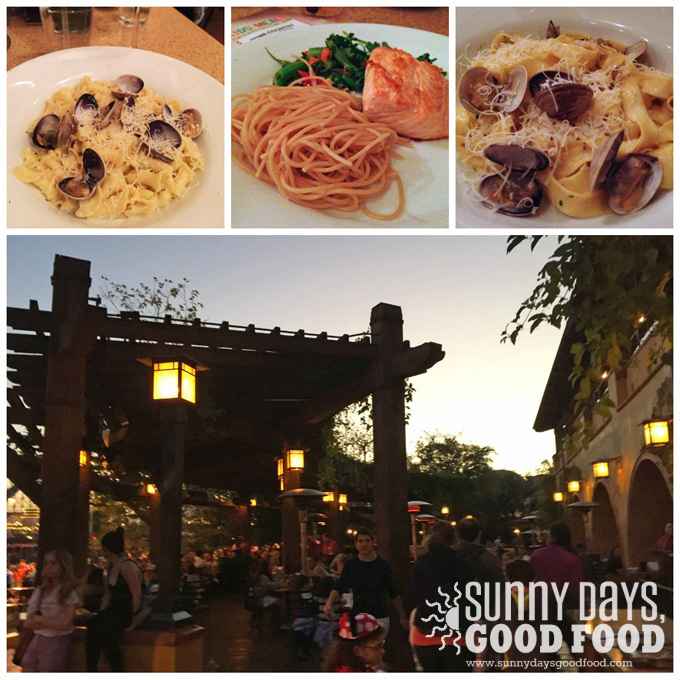 We usually go for the pasta at Wine Country Trattoria. They have five different preparations and you can choose whether you’d like it made with spaghetti, fettuccine or campanelle. Mike and I both got the “alla vongole” preparation, which is clams in a garlicky light cream sauce — he got fettuccine, I got campanelle. The pasta was a little ho-hum this time around, I’m afraid — we kind of wished there was a little more sauce. I also ordered a little side of vegetables just to have something green. Our little girl picked the fish of the day, which was salmon, and our little guy had plain pasta with butter (I didn’t think we needed to capture a pic of that :-)). I did, however, snap a pic of this kiosk (above). 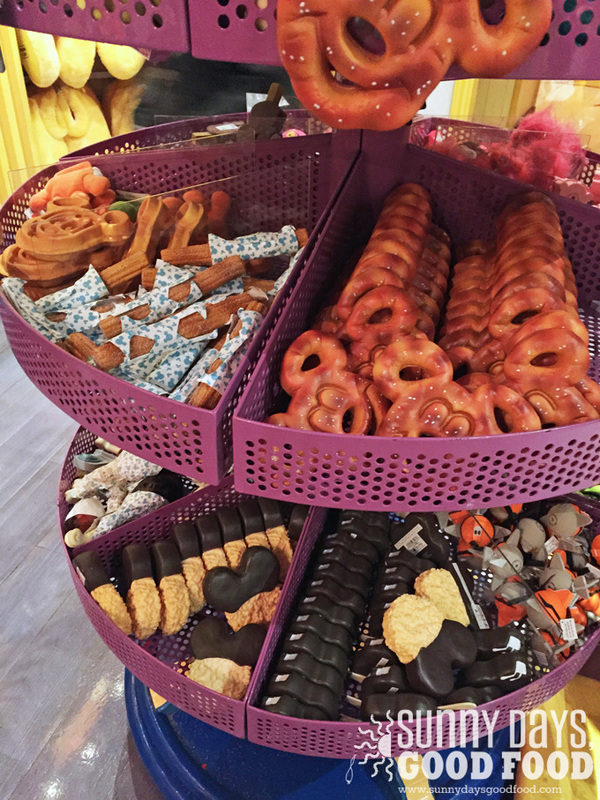 This is in one of the Paradise Pier gift shops — it’s all fake food! I couldn’t tell if they were pet toys or pretend food for your playroom, but I was surprised/impressed to see the breadth of plastic replicas you could buy. Still, I would take a real churro over a fake one any day — ha! Just to put the volume of food displayed here into some perspective, just keep in mind that we were walking all day long for two days. They should seriously sell Disney orthotics (not kidding). It is worth it, though, to stick it out all the way until nighttime (or at least go back to your hotel and return later in the day) — the lights at the park are pretty magical. 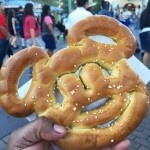 This was just half of the fun…in my next post, I’ll share our finds at Disneyland! 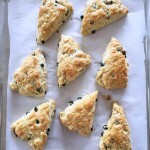 Kathy Strahs is an author (The Ultimate Panini Press Cookbook) and food blogger (Sunny Days, Good Food, Panini Happy and Cooking On the Side). 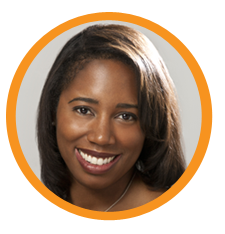 Her innovative recipes and mouthwatering food photography have been featured on The New York Times, The Washington Post PBS, The Huffington Post, Saveur and TLC websites, in Pillsbury Magazine, San Diego Family Magazine and the Associated Press and highlighted in The Wall Street Journal. She is also a frequent cooking contest judge, including for the Grilled Cheese Invitational in Los Angeles and the World Food Championships in Las Vegas. After 12 years in Southern California, Kathy, her husband, Mike, and their two little kids recently moved back to the Silicon Valley. Love it. Great summary of a great trip!